Howells’s ‘Coll Reg’ is one of the glories of the Anglican repertoire — a relative outsider to the church providing one of its greatest adornments of the twentieth century. Stephen Layton and his award-winning choir took the trip to Coventry Cathedral for this very special recording. Herbert Howells may have been an Oxford man by education, but he came to forge his closest links with the ‘other place’: Cambridge. From 1941 to 1945 he was organist of St John’s College while Robin Orr was on active service in the RAF, and his involvement in Cambridge’s musical life continued when towards the end of the war he was asked by a select group led by Eric Milner-White to provide liturgy music for King’s College (or Collegium Regale, to give its Latin appellation). He set the Matins canticles first (Te Deum and Jubilate), in 1944, and a year later those for Evening Prayer (Magnificat and Nunc dimittis). Ever since, the nickname for these setting, ‘Coll Reg’, has been enough to lift the hearts of choral music lovers everywhere. But his involvement did not end there: in the 1950s he expanded the Collegium Regale collection to include the music for the order of Holy Communion – Kyrie, Credo, Sanctus, Benedictus and Agnus Dei, with a concluding Gloria reflecting its placement in the Book of Common Prayer. 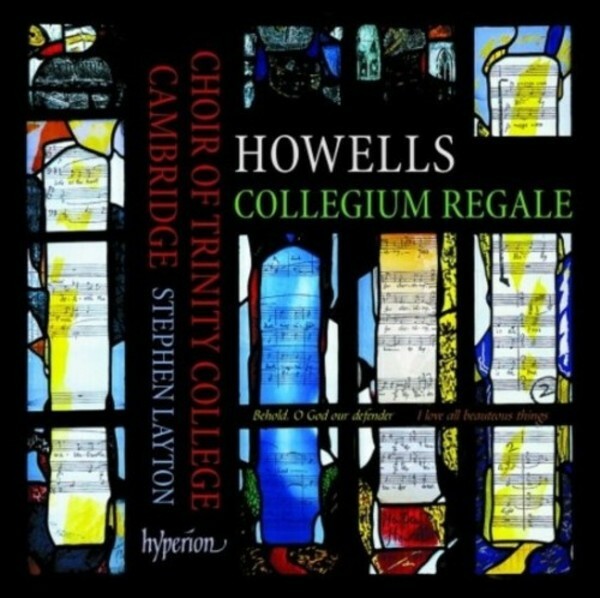 In this marvellous new disc from Hyperion, it is the Choir of Trinity College Cambridge that gathers together the complete Collegium Regale music, and they do it truly handsome service. Under their Director of Music, Stephen Layton, they recorded the disc in Coventry Cathedral – an appropriate choice, as the building, like Howells’ music, reflects the post-war Anglican renewal. Underpinned by the cathedral’s splendid Harrison & Harrison organ, the Trinity choir’s singing from the very opening Jubilate is robust yet beautifully shaped, with an underlying purity of tone that reflects the very finest of the English choral tradition. The composer’s essentially introspective style is heard at its best in the Magnificat and Nunc dimittis (the latter with a moving solo from tenor Jamie Roberts), but the Magnificat’s doxology is gloriously full-throated and soaring (see the YouTube video!). The Communion movements combine brevity with expressivity, and even the Te Deum – a text used over the years in many a musical monstrosity – is as notable for its conciseness as for its power. In addition to the Collegium Regale settings, the disc includes a well-chosen and wide-ranging selection of Howells’ other sacred music. Earliest are two accomplished psalm chants from his student days – Psalms 121 and 122 – and a solo organ Rhapsody from 1915 majestically unfolded by Owain Park. The Coronation Introit ‘Behold, O God our defender’ (1952) is given a wonderfully sensitive performance, but the real icing on the cake is the 1977 Robert Bridges setting, ‘I love all beauteous things’. Commissioned by St Albans Cathedral, it represents Howells’ late style in all its exquisite glory, and the Trinity choir excels itself, unerringly scaling the musical heights and plumbing the emotional depths as they do throughout this programme. The exceptionally warm recording is first-rate, as is the presentation, and – with extensive notes from Howells expert Paul Andrews – for lovers of top-quality choral singing this disc is simply unmissable.